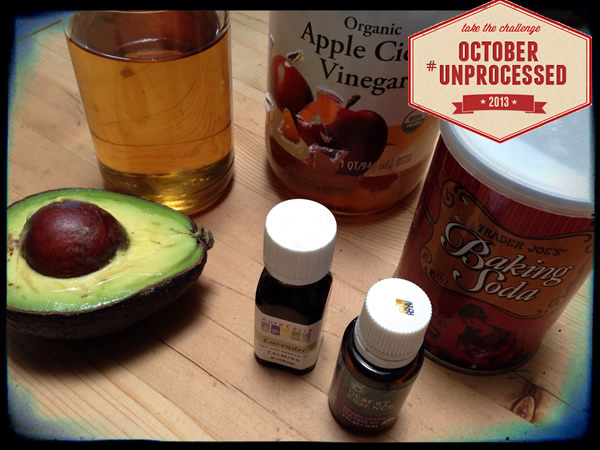 I’m joining Andrew Wilder of Eating Rules in spreading the word about October Unprocessed. You can take the pledge here to spend the month eating unprocessed. Going unprocessed for a month really changed my life in profound ways, and I wanted to share just how much by talking about my hair care products instead of food. When my friend Peg got cancer and started learning more about environmental toxins, it had a huge effect on me. I started eliminating plastic in my life and using glass jars whenever possible. I stopped wearing perfume and switched to organic essential oils. I changed my make-up to organic mineral makeup from Cowgirl Dirt. And I stopped buying shampoo. Shampoo: 1 T. (5 g) baking soda mixed with 16 oz. (500 ml) water plus 10 drops lavender/tea tree essential oil blend. Shake well. Wet your hair thoroughly, then pour this on/over your scalp. Massage in. This does not lather, but when you rinse it out your hair will feel clean (not squeaky clean, that’s actually hair that’s been stripped of oils). My hair feels a lot thicker now. Conditioner: 2 T. (30 ml) apple cider vinegar with 16 oz. (500 ml) water plus 10 drops lavender essential oil. Shake well. Pour over rinsed hair, let sit a few minutes, then rinse out. Deep conditioner: 1 spoonful avocado (this is the perfect way to use the bad parts of an avocado) plus 4-6 T. (60-90 ml) honey. Mash the avocado very well, then add the honey; mix until runny. Don’t add more avocado, you just need a small amount or else it takes real shampoo to get the oil out of your hair. Avocado is intensely oily, and honey is hydrating. Comb through dry hair, working it into the hair and scalp (while bending over a sink or tub). If desired, cover your hair with plastic wrap or a bag. The bag will trap heat, warming the conditioner and helping it penetrate. Let sit at least 30 minutes, then shampoo out. Not only do these cost pennies per use, but I know every ingredient, my hair looks great, and I’m reducing my carbon footprint and my exposure to chemicals. Have you tried going unprocessed? What worked for you? How interesting! I might have to try that shampoo and conditioner strategy! Once I got used to it, I really love it. And I love that I’ve reduced so many chemicals in the house. Thanks for inspiring me to do so!